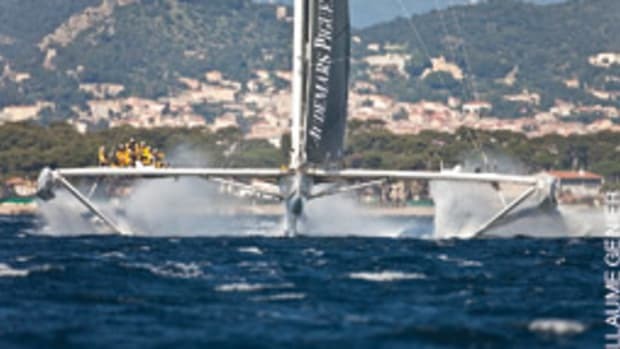 British solo sailor Alex Thomson, 34, tries his hand at “stand up foiling” with a Carafino Hydrofoil board behind his IMOCA Open 60 Hugo Boss in the Solent, off the Isle of Wight. “It’s pretty extreme,” Thomson says. 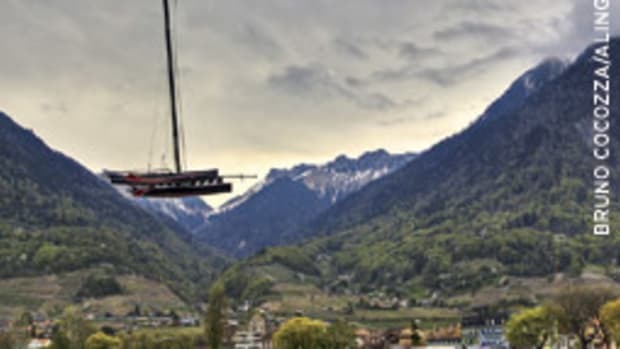 “At a certain speed, the hull is lifted above the water and the craft skims along on the hydrofoils at great speeds. It’s like snowboarding, just on water.” Thomson recently completed his “3 in 3” trifecta of three round-the-world races in three years. His next bluewater race will be in the Rolex Fastnet Race in August. 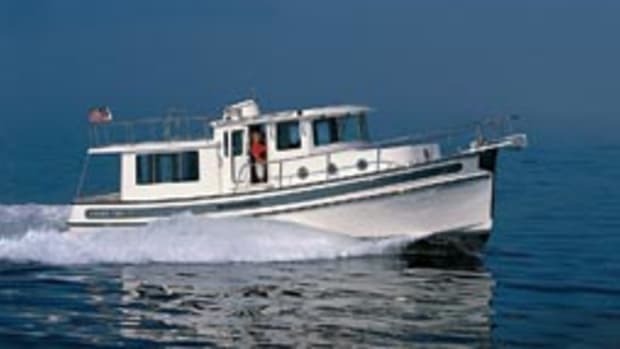 With its plumb bow and fine entry, the Rockharbour 42 looks like a Down East lobster boat. But its pronounced bow flare also indicates a Carolina influence. That combination — not to mention its gentle tumblehome transom — makes the Rockharbour a real head-turner. 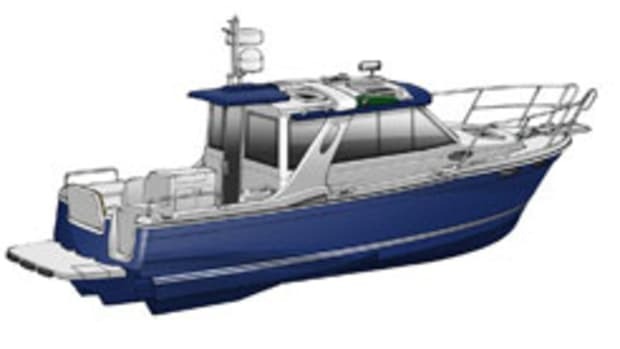 The Turkish-built boat, powered by twin Volvo Penta IPS500s (370 hp), is sold in the United States through Lazmar International of Severna Park, Md. 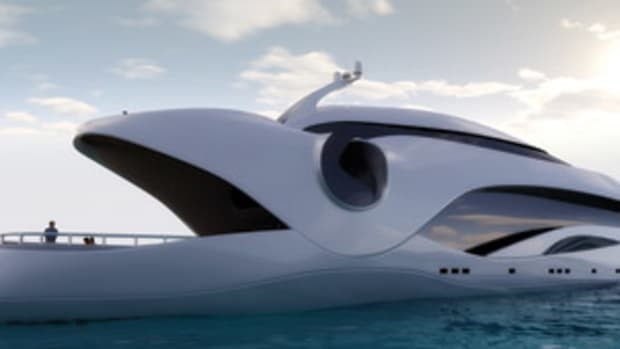 The hull, deck and pilothouse are cored with closed-cell foam for weight savings, and the fiberglass skins are bonded to the core using vinylester resin in the vacuum-bagging process, says Lazmar managing member Hakan “H.B.” Bolel. 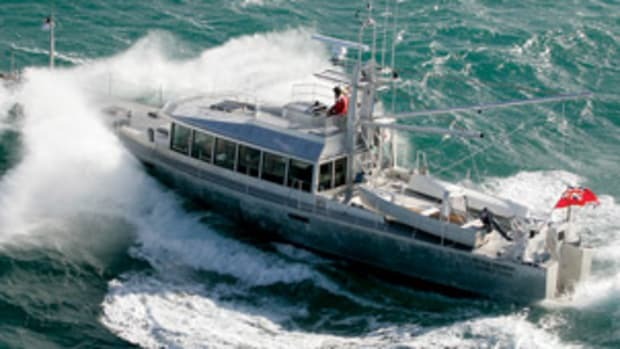 The modified-vee hull has a 66.5-degree entry, reducing to 22 degrees amidships and flattening to 15 degrees at the transom. The 42-footer has a beam of 13 feet, 8 inches, a draft of 3 feet, and a displacement of 26,400 pounds. The IPS500s push the boat to a 38.5-mph top end. At a cruise of about 32 mph, the engines burn roughly 25 gallons per hour, which equates to nearly 1.3 miles to the gallon, says Bolel. The builder offers three different interior layouts. The first includes a master stateroom forward and a starboard-side double-bunk stateroom. For the second layout, the port-side galley is moved from the saloon area and takes the place of the second stateroom. With the third layout, the second stateroom has a large single berth, and the galley moves from the port to the starboard side in the saloon area. The swim platform and cockpit sole are teak. There’s ample seating in the cockpit, as well as a dinette area in the saloon. 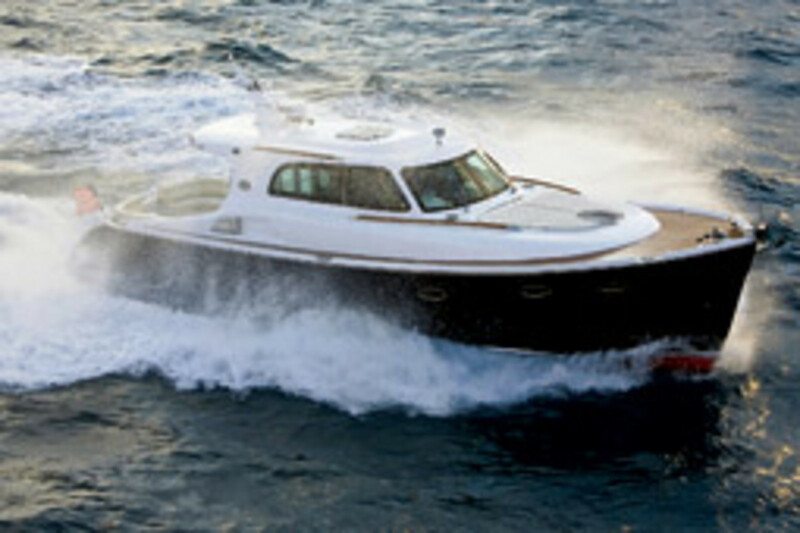 The Rockharbour 42 sells for $601,694 with the twin IPS500s and $632,768 with twin IPS600s (435 hp). The flybridge version is $683,615. Contact Rockharbour Yachts, Severna Park, Md. Phone: (410) 777-5172. www.rockharbouryachts.com. Air Apparent, the sailboat abandoned off northern New Zealand last year when the crew set off the EPIRB against the captain’s wishes, was recovered 14 months later. The late May discovery was made by fishermen in Queensland, Australia, 870 miles from where the boat had been left. In March 2008, the 26-foot Air Apparent was sailing in conditions that had deteriorated to rain and nearly gale-force winds. The crew was concerned about skipper Bill Heritage’s judgment and activated the beacon. Heritage told rescuers they were not in peril amid 10-foot seas and 30-knot winds, with an engine that wouldn’t start. Air Apparent was valued at $24,000, and Heritage had abandoned salvage plans as too expensive. Various reports of the “ghost ship” placed the drifting sailboat off eastern and southern Australia. Announcing June 1 that his company had filed for Chapter 11 bankruptcy reorganization protection, Genmar Holdings chairman and CEO Irwin Jacobs noted that previous economic downturns “do not even remotely resemble” anything close to what has taken place in the industry during the last year. Genmar owns 15 boat lines, including Carver, Four Winns, Glastron, Hydra-Sports, Larson, Ranger, Seaswirl, Triumph and Wellcraft. The company has until Sept. 29 to file its Chapter 11 plans, according to court documents. Garmin is conducting a voluntary product safety recall of its 2009 BlueChart g2 and g2 Vision data cards. In certain waters, the cartography provides inaccurate indications of water depth. The affected cards — sold between April 8 and June 3 — are the 2009 version of the BlueChart g2 in Garmin proprietary card format, BlueChart g2 in microSD/SD card format, and BlueChart g2 Vision in microSD/SD card format. Customers will get a free replacement BlueChart or BlueChart g2 Vision v2008.5. When the 2009 version has been corrected, Garmin says it will be offered free of charge to those customers. Visit www.garmin.com/bluechartrecall for more. In August 1933, the four-masted schooner G.A. Kohler, sailing without cargo from Baltimore to Haiti, was caught in a hurricane off Cape Hatteras, N.C. Her captain deployed an anchor in 90 feet of water, hoping to ride out the storm. When the anchor was lost, a second was deployed, and the captain, his wife and crew took refuge in the forecastle head. 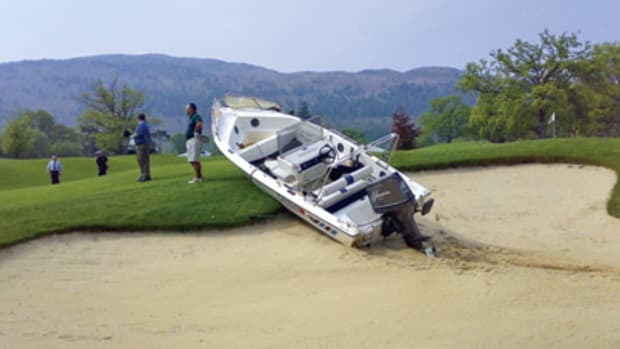 The ship was eventually driven ashore and pounded on the beach. After the storm passed, the uninjured crew was rescued and the ship abandoned, where she remained intact for years. During World War II, a salvor burned her on the beach in an effort to recover scrap iron from her hull. The outline of her hull can still be seen from the air today.